This healthy, hearty and satisfying breakfast option is excellent source of calcium, fiber, iron and essential fatty-acids. 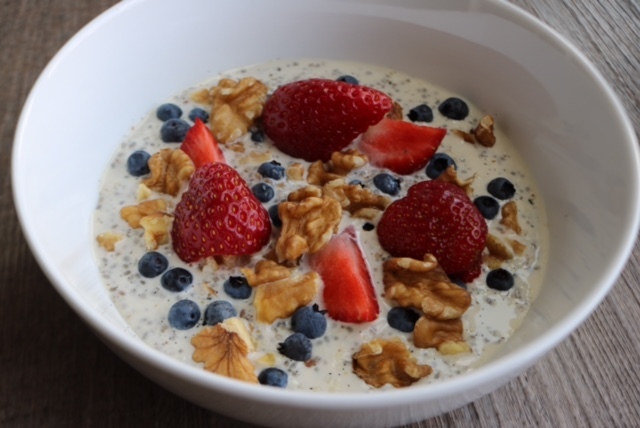 Both flax and chia seeds contain Omega-3 fatty-acids which have been shown to play a role in cardiovascular health, blood sugar regular, inflammation and brain health – to name a few. In a mixing bowl whisk together almond milk, chia, flax, hemp, honey and cinnamon. The mixture will start to gelatinize in a minute or two. Top with berries, cacao nibs and walnuts.